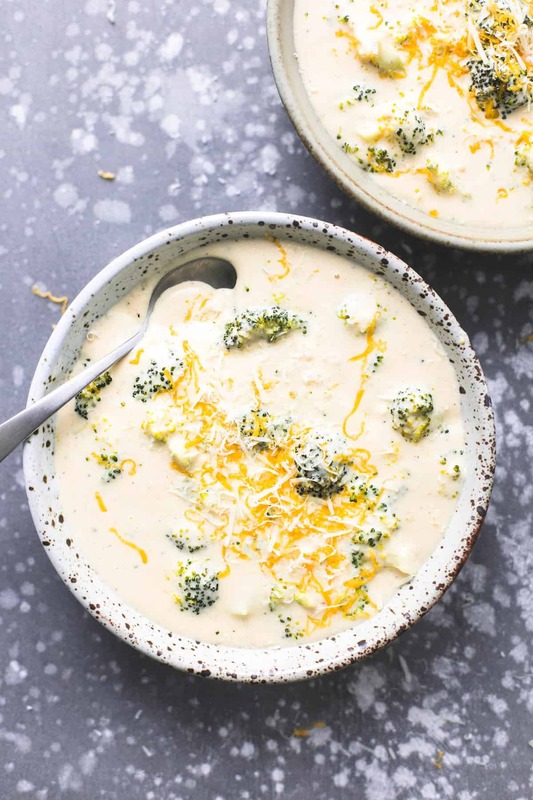 You’re only 30 minutes away from eating the BEST Ever Broccoli Cheese Soup and it all starts with some fresh broccoli, sharp cheddar cheese, and a handful of pantry ingredients. 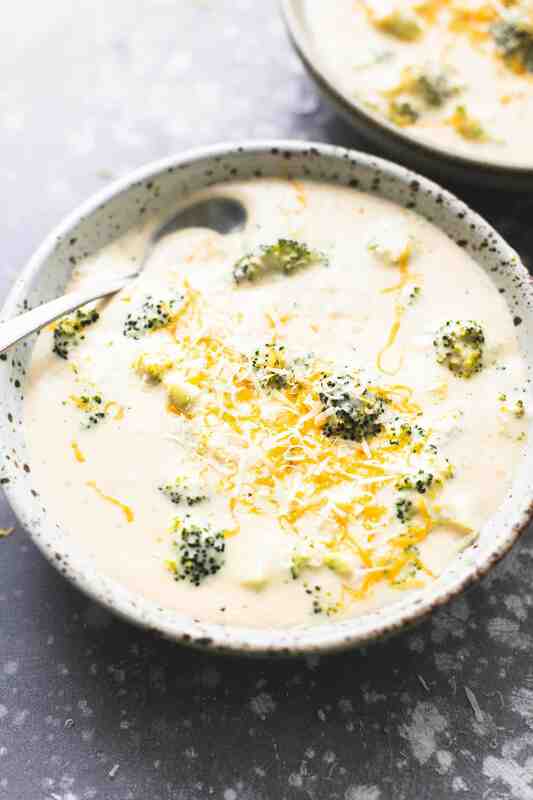 This is the only cheesy broccoli soup recipe you’ll ever need! Cheesy, warm, hearty soups are one of my favorite ways to keep warm this winter! Try Roasted Cauliflower Soup, Olive Garden Chicken Gnocchi Soup, Creamy White Chicken Lasagna Soup, and Slow Cooker Cream Cheese Chicken Chili. Even though the calendar hasn’t officially declared the season of winter yet, it might as well be where I live. It’s cold, and that means all the soups. Chicken noodle, creamy pumpkin, or chowder, doesn’t matter, I’m all in. Toss in a vegetable and some cheese, and you have yourself a nice, warm, hearty vegetarian soup at that. Sometimes, you just don’t need the meat. The cheese and other dairy provide plenty of protein and calcium for a meal. A lot of restaurants have Broccoli Cheddar Cheese Soup on their menus and, while it’s delicious, it’s also not that great for you and I always feel like I can make a better version of just about anything at home, where I can control my own ingredients. Plus, I like to know what my kids are eating, too. That’s not to say we never go out to eat. Sure we do. But when we’re home, it’s homemade all the way. Although creamier soups tend to have more fat and not be, well, as healthy for you, I actually prefer this version with the fat free half and half. It’s more soupy, less thick this way. And as for the broccoli — the smaller the pieces, the better. You want to get little pieces of broccoli in every bite, you shouldn’t have to eat this dish with a knife and a fork. You could also use frozen, chopped broccoli if you were in a pinch. A lot of times it’s easier to throw in something that’s already been pre-cut for you. The great thing about broccoli is that it can be made in a lot of different ways. Steamed. There are two ways to go about steaming broccoli. The first is to do it in the microwave. You can simply purchase one of the steam-in-bag microwaveable bags of broccoli and follow the directions on the bag. The second is to put it in a microwave-safe dish, with a lid. Add a couple tablespoons of water to the broccoli, and steam it in the microwave on high for about 3-4 minutes. Check for doneness, stir, and microwave in 1-2 minute increments until you’ve reached desired doneness. Second, you can steam it on the stovetop. Add about half a cup of water to the bottom of a large sauce pot. Put the chopped broccoli into a steamer basket and put the basket into the pot. Cover and steam for 5-7 minutes, or until desired doneness is achieved. Sautee. Add cooking oil to a stainless steel or cast-iron skillet or wok and turn the burner on high. Add your broccoli and toss, until they start to turn brown. Add in your favorite sauces or deglaze with white wine, stock, lemon juice, or vinegar, etc. until the broccoli is tender yet still a little firm. Roasted. This is one of my favorite ways to make broccoli. I add cut broccoli to an oven-safe baking dish or cookie tray (the ones with sides). Preheat oven to 425. Coat your broccoli with oil, spices, and an acid, like I did in this Roasted Lemon Garlic Broccoli & Cauliflower. Add your veggies in one layer to your pan or tray. Sprinkle with Parmesan, if desired, and cook for 15-20 minutes until the broccoli can be pierced with a fork and starts to brown. Puree. This method is great for soups that call for pureed veggies. First, cook your broccoli in chicken or vegetable broth until it’s nice and tender. 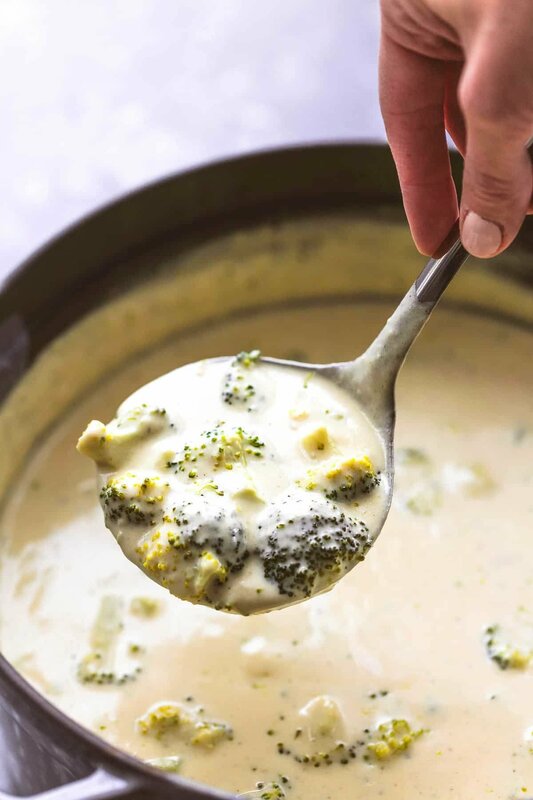 Add the broccoli and broth to a blender (be sure to leave an opening in the lid and cover loosely with a towel when blending) or use an immersion blender to puree the mixture until it’s nice and creamy. HOW LONG DOES BROCCOLI KEEP IN THE FRIDGE? If you’ve just purchased broccoli but you’re not quite ready to use it, but also not sure how long it will keep, I can help you with that. You should keep your broccoli in the fridge, in a loosely tied plastic bag. Don’t wash it until it’s ready to use. It should stay fresh for about 3-5 days. If you’ve purchased pre-cut broccoli or cut it yourself, you can keep it in the fridge for up to 2 days. If it’s been cooked, it’ll be okay to eat for up to 5 days, so long as it’s been kept in the fridge. 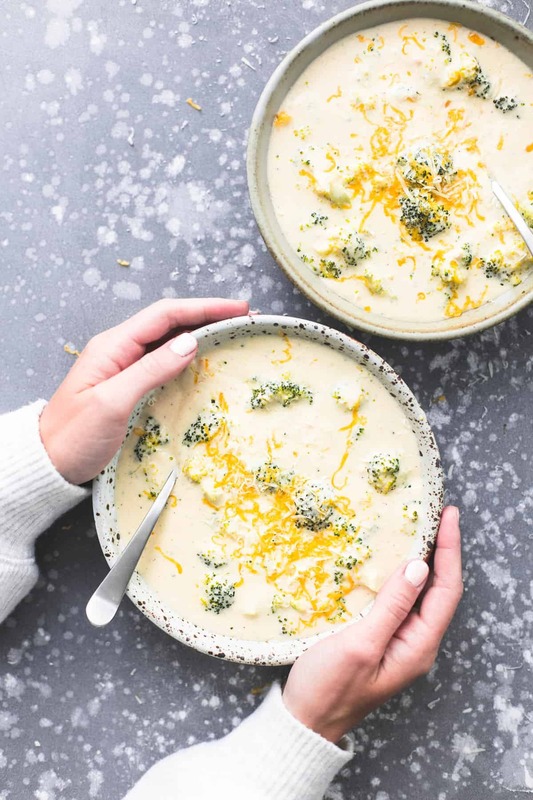 You're only 30 minutes away from eating the BEST Ever Broccoli Cheese Soup and it all starts with some fresh broccoli, sharp cheddar cheese, and a handful of pantry ingredients. 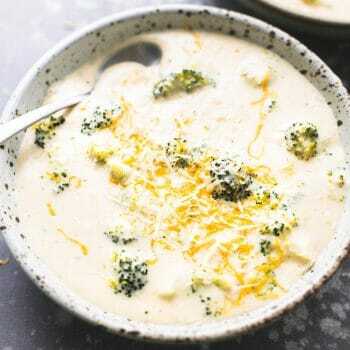 This is the only cheesy broccoli soup recipe you'll ever need! In a large stock pot, melt butter then add garlic and saute for 1-2 minutes until browned. Add onion powder and flour and stir until mixture clumps together and there are no more streaks of flour. Gradually whisk in chicken broth, followed by half and half. Bring to a boil, add broccoli and boil until broccoli is tender. Stir in salt, pepper, cheddar cheese, and parmesan cheese. Once cheeses are completely melted, taste and add salt and pepper if needed, then serve. DO NOT use pre-shredded cheese, please grate cheese from a block! 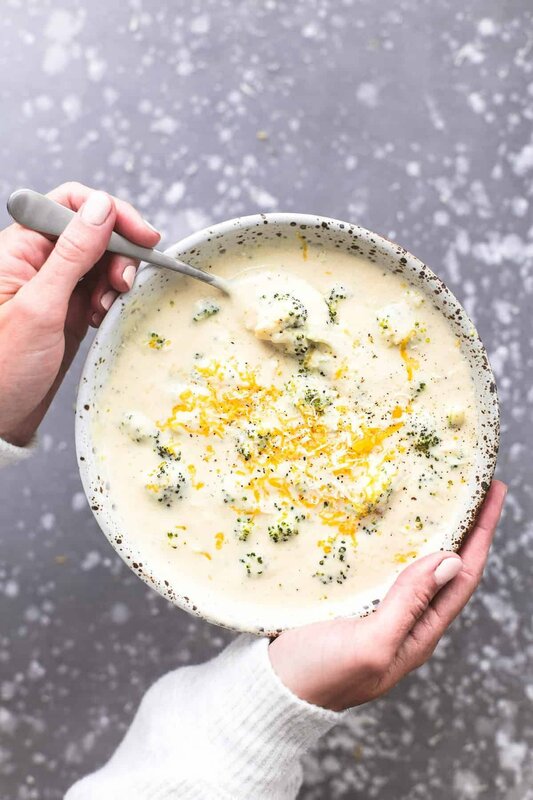 Cheese that comes already grated is tossed in a powdered coating that causes it to melt differently than fresh-grated cheese and will give your soup a gritty texture. Use freshly grated cheddar and parmesan cheese! This is my favorite version using fat free half and half, sometimes for a richer soup I swap out 1 cup of half and half for 1 cup of heavy cream. Thanks so much, Shawnna! You’re the BEST! There is absolutely nothing better than Creamy Cheesy Broccoli Soup. and yours looks fabulous. I’m needing some comfort food right now and this is going hit the spot!!! thanks for the post. Thanks, Kristy! It is the BEST on these cold (and in my current case, rainy) days! This soup looks soooo good! My wife is a broccoli soup addict so i know she’ll really like this! Thanks, Bryan! She’s gonna love this one!! DO you have an idea of how much this makes? Servings? Pints? I need to make soup for a fundraiser and am curious. It serves 4-6 people as written!